Richard manages the reserve at WWT’s Caerlaverock Wetland Centre on the shores of the Solway Firth. 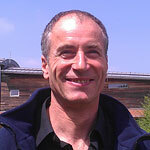 He joined WWT in the 1970s and worked at Slimbridge with both the captive collection birds and on the reserve. Since moving to Caerlaverock in 1986 he has mainly been Reserve Manager. Richard has led more than 10 WWT expeditions to Iceland working on whooper swans. His previous Russian experience was on a Bewick’s swan expedition.